a circumscribed stable malformation of the skin or sometimes the oral mucosa, which is not due to external causes; the excess (or deficiency) of tissue may involve epidermal, connective tissue, adnexal, nervous, or vascular elements. Most are either brown, black, or pink; they may appear on any part of the skin, vary in size and thickness, and occur either in groups or alone. See also mole. A nevus is usually not troublesome unless it is unsightly or disfiguring or becomes inflamed. If it changes noticeably, malignancy may be suspected, especially if any of the following are present: a highly irregular border, an uneven (pebbly) surface, or a mixture of colors (especially black, gray, or blue). Any change in size, color, or texture, or any bleeding or excessive itching, should be reported to a health care provider. Nevi can be removed by surgery or by other methods such as the application of solid carbon dioxide, injections, or radiotherapy. blue nevus a dark blue nodular lesion composed of closely grouped melanocytes and melanophages in the mid-dermis. blue rubber bleb nevus a hereditary condition marked by multiple bluish cutaneous hemangiomas with soft raised centers, frequently associated with hemangiomas of the gastrointestinal tract. nevus comedo´nicus a rare epidermal nevus marked by one or more patches 2 to 5 cm or more in diameter, in which there are collections of large comedones or comedolike lesions. This condition is occasionally associated with other lesions such as ichthyosis, vascular nevi, and cataracts. compound nevus a nevocytic nevus composed of fully formed nests of nevus cells in the epidermis and newly forming ones in the dermis. connective tissue nevus any nevus found in the dermal connective tissue with nodules, papules, plaques, or combinations of such lesions. Histologically, there is inconstant focal or diffuse thickening and abnormal staining of collagen. epidermal nevus (epithelial nevus) a circumscribed congenital developmental anomaly resulting in faulty production of mature or nearly mature cutaneous structures; such nevi vary widely in appearance, size, and distribution and are commonly hyperkeratotic. nevus flam´meus a congenital vascular malformation involving mature capillaries, present at birth. It consists of a reddish purple lesion that is flat or barely elevated and does not fade with age. It is a benign condition but may be associated with other syndromes such as sturge-weber syndrome. The dark variety is called a port-wine stain and a light variety is called a salmon patch. (See Atlas 1, Part E). giant congenital pigmented nevus (giant hairy nevus) (giant pigmented nevus) any of a group of large, darkly pigmented hairy nevi, usually bilaterally symmetrical and present at birth; the most common locations are the chest, upper back, shoulders, arms, legs, and or hip and groin area. These nevi are associated with other cutaneous and subcutaneous lesions, as well as neurofibromatosis and other developmental anomalies, and they exhibit a predisposition to development of malignant melanoma. halo nevus a pigmented nevus surrounded by a ring of depigmentation; called also leukoderma acquisitum centrifugum, Sutton's disease, and Sutton's nevus. intradermal nevus a type of nevocytic nevus clinically indistinguishable from compound nevus, in which the nests of nevus cells lie exclusively within the dermis. nevus of Ito a mongolian spot–like lesion having the same features as nevus of Ota except for localization to the areas of distribution of the posterior supraclavicular and lateral cutaneous brachial nerves, involving the shoulder, side of the neck, supraclavicular areas, and upper arm. nevus lipomato´sus one that contains much fibrofatty tissue. melanocytic nevus any nevus, usually pigmented, composed of melanocytes. nevocytic nevus (nevus cell nevus) the most common type of nevus, usually more or less hyperpigmented, initially flat but soon becoming elevated, composed of nests of nevus cells. These nevi are classified as compound, intradermal, or junction according to the histologic pattern and location of nevus cells. Called also mole. nevus of Ota (Ota's nevus) a persistent mongolian spot–like lesion, usually present at birth and unilateral, involving the conjunctiva and skin about the eye, as well as the sclera, ocular muscles, retrobulbar fat, periosteum, and buccal mucosa. It is a blue or gray-brown patchy area of pigmentation that grows slowly and becomes deeper in color. Although the lesion is benign, malignant melanoma occasionally develops, usually in the iris. pigmented nevus (nevus pigmento´sus) one containing melanin; the term is usually restricted to nevocytic nevi (moles), but may be applied to other nevi that have pigmentation. sebaceous nevus (nevus sebaceus of Jadassohn) an epidermal nevus of the scalp or less often the face, frequently growing larger during puberty or early adult life. In later life, some lesions may give rise to a variety of new growths, including basal cell carcinoma. nevus spi´lus a smooth, tan to brown, macular nevus composed of melanocytes and speckled with smaller, darker macules. spindle and epithelioid cell nevus a benign compound nevus occurring most often in children before puberty, composed of spindle and epithelioid cells located mainly in the dermis, sometimes in association with large atypical cells and multinucleate cells, and having a close histopathological resemblance to malignant melanoma. nevus spongio´sus al´bus muco´sae white sponge nevus. nevus uni´us la´teris a wartlike epidermal nevus, ranging from flesh colored to brown, found in a linear, unilaterally distributed pattern; on the extremities, the lesions usually follow the long axis, and on the trunk, they usually have a transverse orientation. vascular nevus (nevus vascula´ris) (nevus vasculo´-sus) any of various reddish swellings or patches on the skin due to hypertrophy of capillaries; the term includes nevus flammeus, strawberry hemangioma, blue rubber bleb nevus, vascular spider, and cavernous hemangioma. white sponge nevus a spongy white nevus of a mucous membrane, occurring as a hereditary condition. a congenital skin neoplasm with several cutaneous tissue elements. The most common location is the scalp, face, or neck. It may appear as a yellow or tan waxy patch of alopecia at birth. During puberty the lesion becomes raised, thick, and verrucous. It is usually treated with local excision. 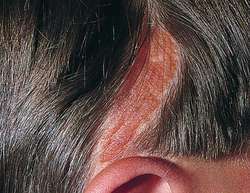 Untreated, the lesion may remain benign or become a malignant growth in later life.